1. Excavate hole for liner to required shape. The sides should be made sloping inwards rather than vertical; cut out deep (45cm minimum) and shallow (approx 25cm) water areas as illustrated. Provided your excavation is carefully levelled around the top edge the liner can be concealed by the finishing edging. 2. Remove any sharp stones or roots and spread a good layer of sand over the base of the pool. We strongly suggest that an underlay with a minimum weight of 180g/m2 (e.g. Gordon Low Underlay) be used to protect the liner. Do not drag the liner into position but unfold it carefully as sharp stones may cut it. Anchor the edge of the liner with smooth sided rocks or bricks, taking care that they are evenly distributed. 3. Gradually run a little water into the pool, pleating and tucking the liner into shape as necessary to give a neat finish. At first the liner will stretch, then as the volume of water increases the liner will move inwards to the shape of the side. Fill completely with water. Check all round for close fitting. Trim off surplus material with scissors allowing sufficient overlap around the pool perimeter for anchorage. 4. 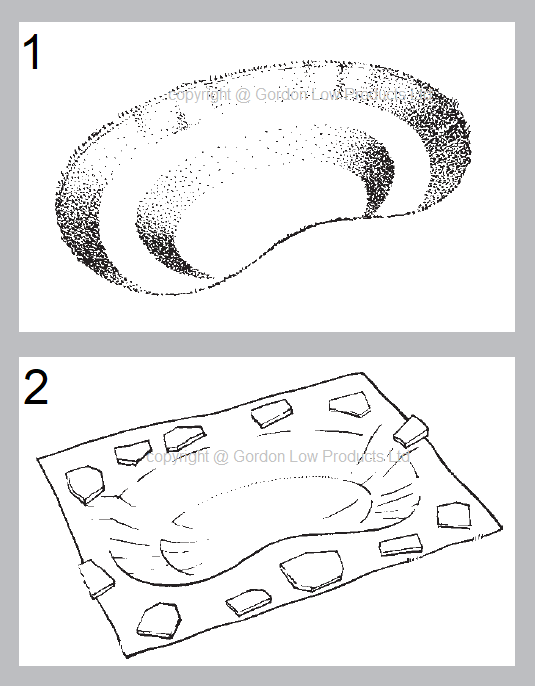 Finish the edges of the pool with paving slabs as shown in the drawing allowing an overhang. 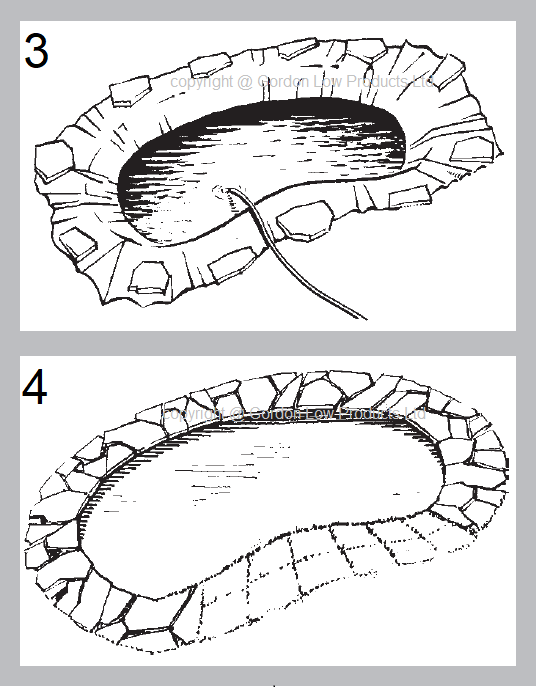 If preferred, turves can be placed over the edge of the liner so that they touch the water. A water garden is not only a decorative feature, it is a living environment in which plant and a host of aquatic life can flourish. The following tips will help to get them established and provide you with pleasure throughout the seasons. Plants are essential to keep the water clean and oxygenated. They should be planted in heavy clay type soil in plastic basket containers lined with hessian. Planting season: April to September. Marginal plants need about 25cm of water. Deep marginal plants need at least 45cm of water. Oxygenating plants will grow at any depth, but usually are placed on the bottom. Water Lilies need at least 45cm of water. Floating plants should be placed on the surface of the water. Fish should be introduced only once plants have become established – at least two weeks. Most fish will live happily together, scavenger types being useful for the bottom of the pond. Your aquatic centre will advise. Alternatively don't introduce fish and instead allow a wildlife pond to evolve. In this case ensure a beach or shallow area for wild life to leave the water if it needs to. Fountains and waterfalls provide extra interest and will benefit fish and plants by adding oxygen to the water. For expert advice on any aspect of water gardening consult your local aquatic centre.